Magnico Contracting, the New Jersey-based construction services company led by Moshe Braude, is nearing completion of a major interior renovation of Ramsey Office Centre. Located at 500 North Franklin Turnpike in Ramsey, NJ, the 138,400 s/f, three-story office property is getting its first major upgrade since its construction in 1988. 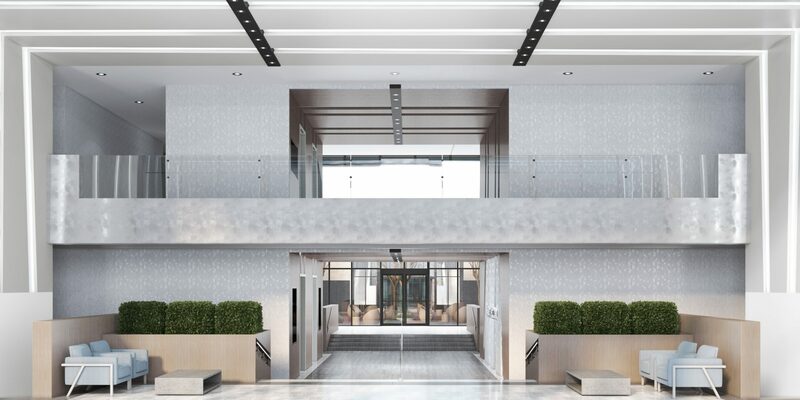 According to Braude, the common areas and all lobbies are being given a state-of-the-art facelift with LED lighting and custom finishes, and the third floor is being outfitted with a host of amenities designed to attract today’s tenants seeking a modern workplace. A newly constructed third floor corridor with contemporary design leads to an amenity center that includes a large conference room, lounge, an 1,100 s/f fitness center with locker rooms and showers, and co-working spaces. “The third floor is the crown of a top-to-bottom makeover that has transformed a dated office building into a modern complex suited to employers looking to attract high-value talent to an innovative and productive workplace,” said Braude, whose firm was retained by owner, Highstone Equity Group, to complete the renovations. Since purchasing the property in 2017 and launching its repositioning effort, Highstone has already attracted several new tenants to the building, which was previously anchored by UPS. Most recently, accounting firm The Marchese Group, Opulence Funding, and logistics specialists WWEX have signed leases for the third-floor office space.